Recreational marijuana prices are falling and, in much of the state, retail options are plentiful. It appears to be a cannabis consumer’s dream, or at least what voters hoped for back in 2014 when Measure 91 was passed. Now, it has not been an entirely smooth ride to date, and concerns remain. Chief among them, as the new Secretary of State audit spells out, would be enforcement and ensuring products are tracked and accounted for. Additionally, potential saturation issues for growers, processors, and retailers indicate that some industry shakeout, or market consolidation is likely. 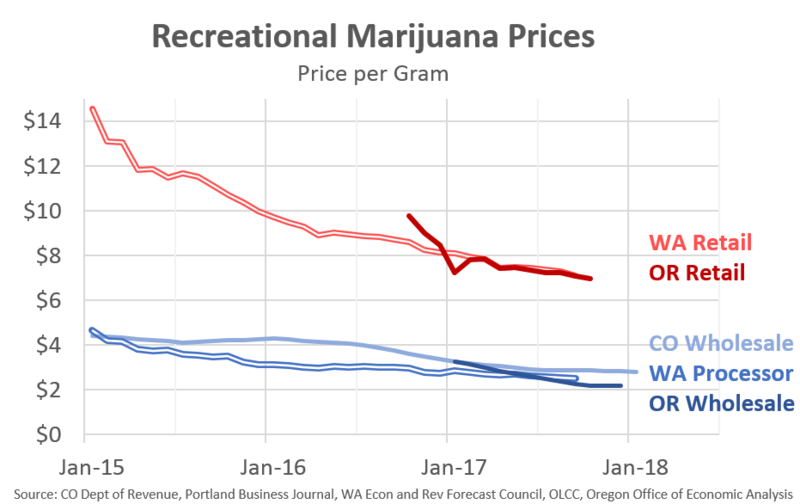 First, marijuana prices are continuing to decline. This is true here in Oregon, and in Colorado and Washington. Much of this is to be expected as businesses become more experienced in the newly legalized industry, which allows for efficiency gains. Furthermore, increased competition can lead to lower prices as well. Now, given Oregon levies the marijuana tax based on price, our office lists price as a risk to the outlook. Lower prices, everything else equal, would lead to lower revenues. However, lower prices should also lead to larger consumption. Demand curves do slope down. Further complicating the marijuana industry is the ongoing presence of the black market, which also competes on price, and can undercut the legal market at least in part due to the lack of regulations, product testing, etc. While lower prices are a clear boon for consumers, they can lead to problems for some businesses. This is particularly true for those unable to adjust due to their business model, fixed costs, debt loads, and the like. For example, a firm may be profitable at a certain price point, however marijuana prices are falling by 10-20% per year. If that firm is unable to lower its operating expenses enough, accept lower profit margins, etc. then it can be in financial trouble. Grumblings within the industry suggest this is happening, at least in part due to market saturation. Now, is it truly a concern from an industry wide perspective, or from a consumer’s point of view? Unlikely. However, for any particular business it can be devastating. 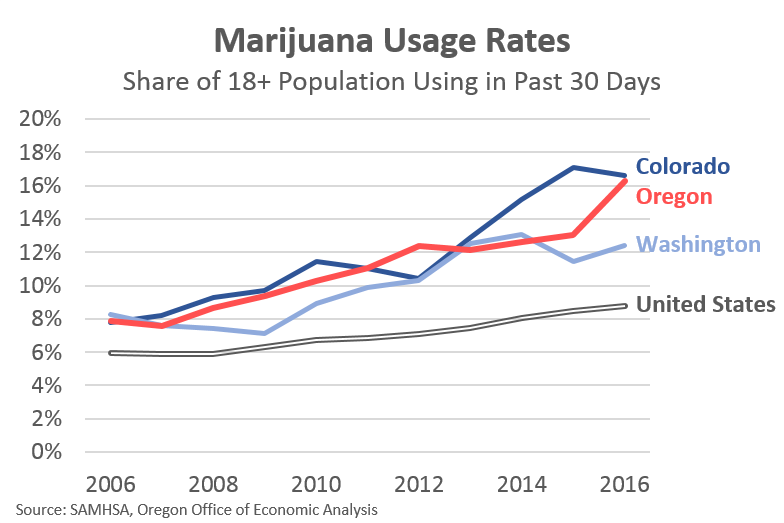 This second chart tries to frame recreational marijuana market saturation here in Oregon relative to Colorado and Washington. In all three states, the number of recreational marijuana retailers is about the same, or just over 500. However, once you adjust the numbers based on population, it is clear that Oregon has significantly more stores. This does not necessarily mean Oregon is over-stored. It may be, but it may also be the case that the other states are under-stored. In fact, Colorado currently supports more marijuana stores overall due to their robust medical marijuana market. 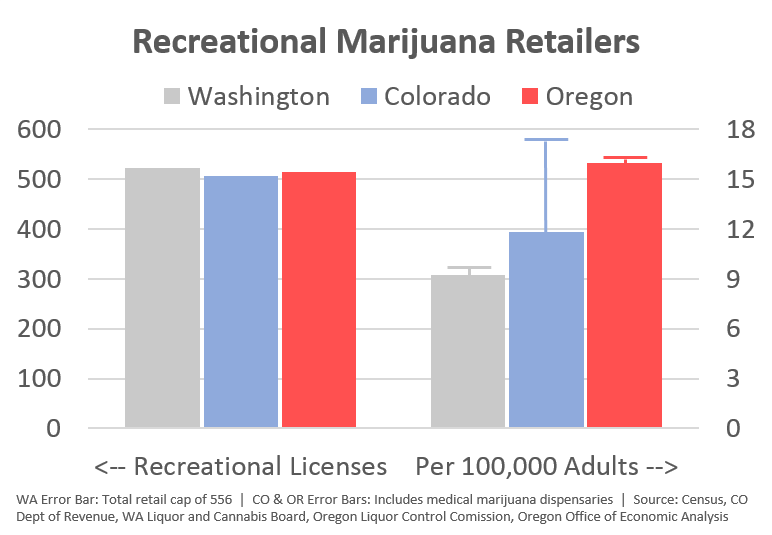 The error bars in the chart are an effort to show both the total number of marijuana storefronts (recreational + medical), in addition to just the recreational stores. Now, there are an additional 140 or so retailer applications in the OLCC system. Should these stores open, it would push Oregon significantly past Colorado, even on a population adjusted basis. What all of this does mean is there is more competition for every Oregon recreational marijuana dollar, and this will likely increase. As such, average sales per retailer in Oregon are lower, leading to the industry shakeout or market consolidation concerns or expectations. Pete Danko had a good article in the Portland Business Journal recently about this. As economist Beau Whitney notes, it’s easy to envision a long-run outcome for marijuana that is similar to the beer industry. One segment of the market is mass-produced and lower priced products. This will be the end result of the commodification of marijuana. Margins will be low, but due to scale, businesses remain viable. These are more likely to be outdoor grow operations as well, due to costs. Even in a world of legalized marijuana nationwide, it is plausible that Oregon, along with California, would remain a national leader in this market due to agricultural and growing conditions in the Emerald Triangle. The second segment of the marijuana market would be similar to craft beer today. This segment would include smaller grow operations of specialty strains, higher value-added products like oils, creams and edibles. Such products will require and command higher prices. However, as our office has noted previously, it is here among the value-added manufacturing processes, in addition to building up the broader cluster of suppliers, and ancillary industries that Oregon will see the real economic impact of recreational marijuana. If all we have are growers and retailers, there will not be a large impact. Furthermore, the long-term potential of exporting Oregon products and business know-how to the rest of the country remains large. Even if this market bifurcation materializes, it does not mean it will be an entirely smooth transformation. Conditions today are great for consumers, but potentially worrisome for some businesses. It will be interesting to watch how the market and industry continues to evolve. Our office’s forecast expects sales to continue to increase due to both new customers as usage increases and social acceptance of marijuana rises over time, and due to black market conversion. It’s the latter that is the most worrisome from a long-run perspective of industry viability. This is why enforcement and compliance are key issues being addressed by policymakers and industry professionals today. The long run average cost of outdoor is $0.60 a gram and, for indoor, about $1.80. I would image that plus inflation minus productivity gains is where the market will settle. And I agree with Beau. There sill be a good sized craft market that might make up 25% of the volume sold, but 50% of the industry revenues. Thanks Bob. We’ve heard figures in the same general range, suggesting prices have significantly further to fall in the coming years.